Oaxaca is a large city in Mexico with strong relations to the Indians. The long history of this place, many attractions and very good tourist facilities make a pure pleasure by spending the time here. This city may be accessed easily from any other big Mexican city. An unacquainted tourist may have some problems after leaving ADO bus station. 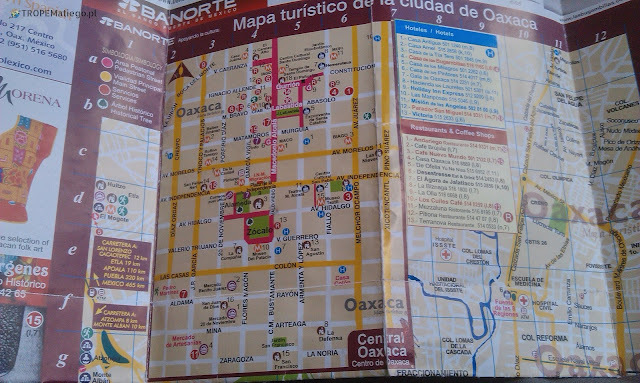 The bus station is located at Niños Heroes de Chapultepec 1012, about 2 km north from city center - Zócalo. The easiest way is to walk south until you reach Av. Independencia. Then turn right (west). After short walk, the cathedral should be visible - this is the city center. 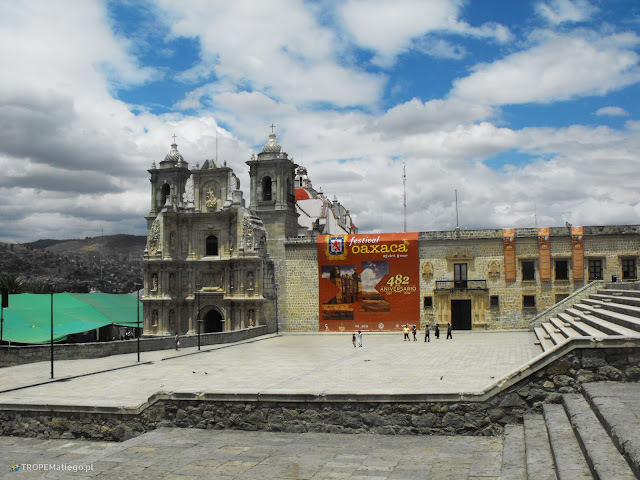 I had the opportunity to spend a few Easter days in Oaxaca. I take the opportunity to write how the Easter is celebrated in Mexico. Easter is a major holy day in Mexico. Many people travel during this period, often for vacations. Maundy Thursday and Good Friday are statutory holidays, so free of work. Holy Monday is an ordinary day, practically it is not celebrated. On Good Friday procession of penitents go through the city. Penitents acts Passions like lashing, carrying chains or bales with prickly plants. On Good Friday or on Holy Saturday in the evening, effigy of Juadas is blow up by fireworks. The effigy is made by cartoon with fruits and sweets inside. The most famous attraction in that region are the ruins of Monte Albán. The ruins are so interesting, that I will write about them in a separate article. 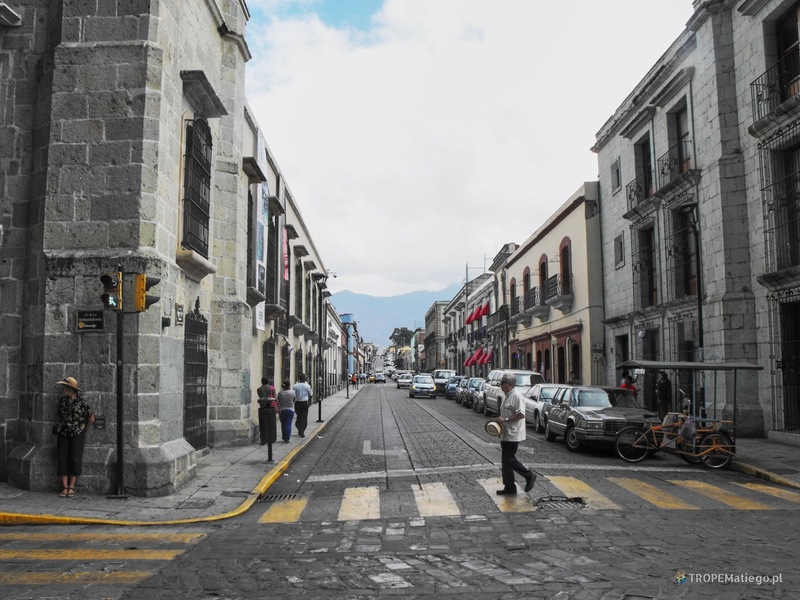 In the city itself, the main points to visit are sacred buildings and markets. At Zócalo, in the Plaza de Leon is Cathedral of Our Lady of the Assumption. 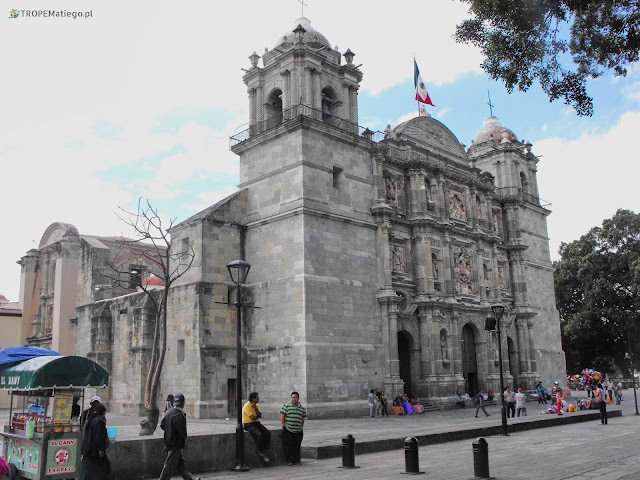 In the city are often earthquakes, so the Cathedral was rebuilt many times. Next to Zócalo is Plaza de Armas. There is plenty of restaurants and cafes. The most rich decorations are in Santo Domingo Church. It is located at the crossroad of Macedonio Alcalá and Gurrión. The church is full of golden ornaments. The ornaments are on the walls, ceiling, practically everywhere. 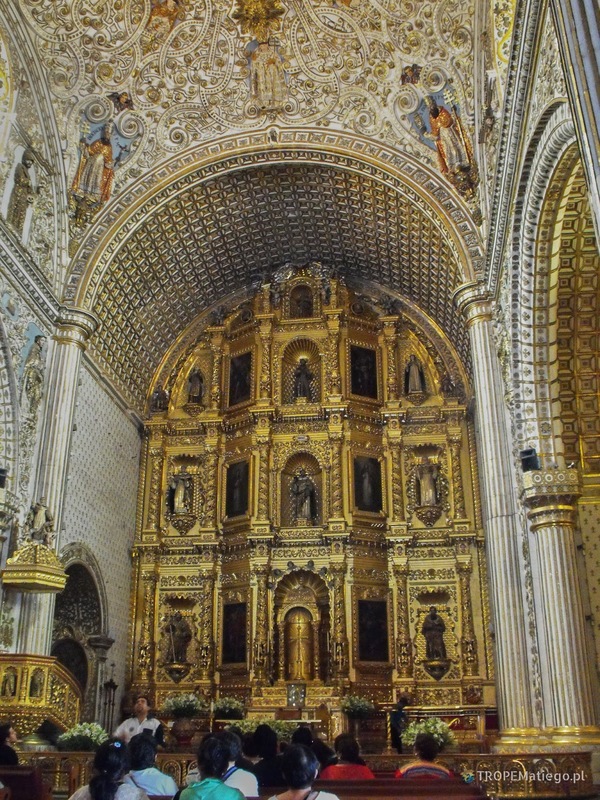 This is the reason why this church was built for 12 million pesos. A bit further west is Basílica de la Soledad built in 1690. In this temple you can see the statue of the Virgin of Solitude with a crown made of 2 kg of gold and 600 diamonds. When you are in Oaxaca you should visit the market. 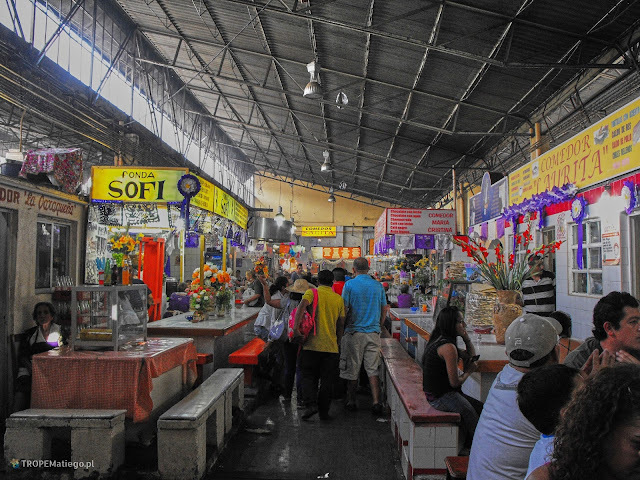 The biggest is Mercado de Abastos. It is located at streets Periférico and Juárez Maza. Next to the market is a local bus station. It is completely different than the ADO bus stations. There is no big security, buses are in a much worse condition (judging by appearance). The market is full of food, textiles and hand-made Indians products. The sellers advertise their products quite loudly at their stalls. The market doesn't look too big from outside, but inside you can feel its size. In the city center is also the Mercado Juárez market.There are mainly hand-made products from city residents and surrounding villages. It is always possible to eat at restaurants. An alternative idea is a dinner at the market. Such a dinner would look like: buy the meat at one seller, tortilla at second one, vegetables and drinks at another ones. All the products are ready to eat. When everything is bought you can go to the free table and start preparing the meal. So, put meat, vegetables, etc on your tortilla according to your preferences. 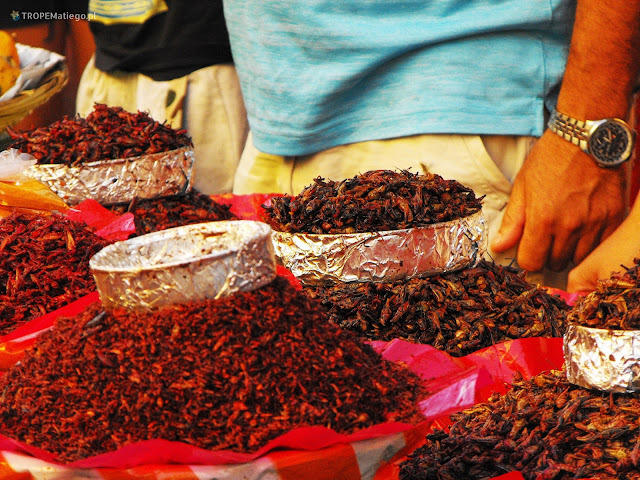 At the market you can buy also other interesting delicacies like worms being sold in kilograms. They are so strongly flavoured that you can't feel the real taste of the worm, only the seasonings. The most popular alcohol in this region is Mezcalo. This strong alcohol is produced from agave with a worm inside. 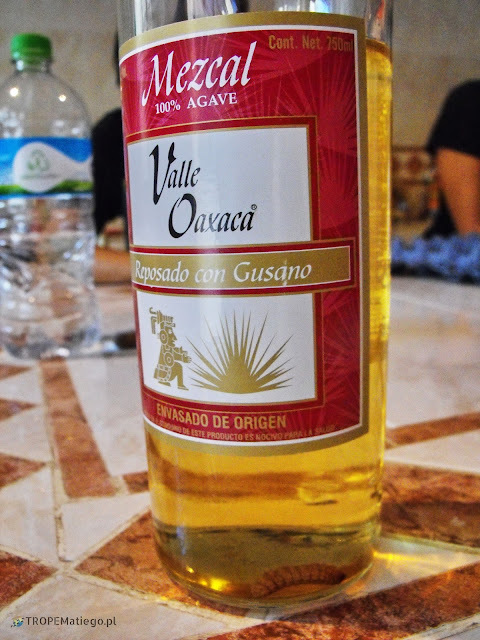 In Oaxaca it's not a problem to find the bottle with that. Even the worms are sold separately. 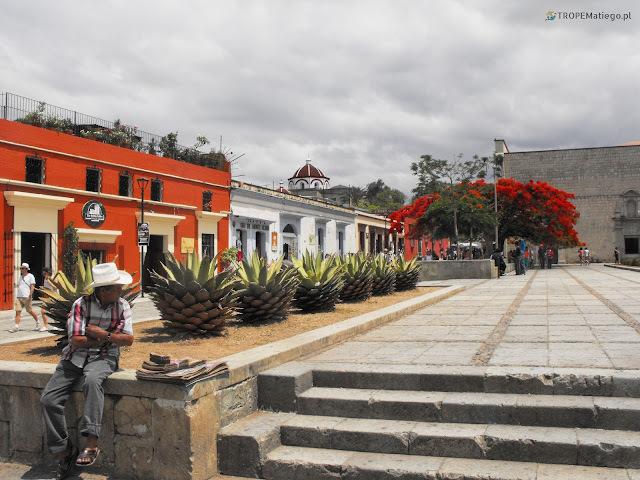 Oaxaca is also known for chocolate. Many people buy cacao beans to prepare chocolate at home. At the market is a stall with machine that produces the chocolate on your eyes. The taste is amazing with perfect smell, it is crispy, it doesn't melt in the sun. It is different than the chocolate from Europe.